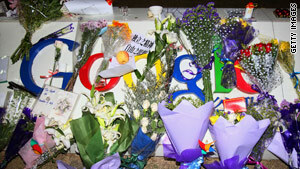 Google.cn: R.I.P or good riddance? Flowers outside Google's China HQ: But the majority of Chinese Internet users don't care about its withdrawal from the mainland. Beijing, China (CNN) -- How do Chinese Internet users feel about Google's decision to move most of its search functions from the mainland? That all depends on who you ask. "You have two categories of Internet users in China," said Isaac Mao, a prominent Chinese blogger and Internet expert. "One strongly supports that Google is either staying here without censorship or pulling out of China to keep neutral and independent. But another layer, maybe 90 percent of Internet users in China, they don't care whether Google leaves or not." Mao represents the first category: A sometimes politicized group of white collar, technologically savvy academics, bloggers and students who frequently vocalize their opposition to censorship in China on blocked Web sites. They often access blocked sites, such as Twitter, using special software to circumvent the "Great Firewall", as China's filtering system is called. Among such elite circles, Google's decision Monday to close Google.cn, the Chinese version of its search engine, and redirect users to its Hong Kong-based search engine, has little direct impact. They are already accustomed to using circumvention technology, which means an uncensored, overseas version of Google remains accessible from the mainland. For them, Google's departure represents a symbolic mix of heroism and grief. Many of them hope that maybe the high-profile exit will make China's Web users, who they say are aloof to government censorship, more aware of it. Then again, maybe not. "Even if Google is a kind of wake-up call, we have no confidence that the censorship will be removed," said Michael Anti, another prominent Chinese blogger. "We are very sad about the situation. Chinese people deserve the free Internet like others. We are not second class citizens. We deserve comprehensive and direct information like our foreign counterparts." Among this pro-Internet freedom group there is also a sense of frustration that Chinese netizens, as the country's Web users are known, have been unfairly left in the dark since Google announced it might exit China on January 12. Earlier this week a widely circulated online petition, titled "An Open Letter to the Chinese Government and Google from China Netizens," emerged. It urges Google to provide more information on the censorship rules Beijing imposed on the company as well as considering the needs of Web users. "They did not ask Chinese users what they want," said Steven Lin, a Beijing-based blogger. "I think most Chinese Internet users feel they have been ignored. It is a big market and we have been helping Google get more and more users for so many years. They cannot make such a quick decision without asking how Internet users feel in China." Others say they are even more frustrated with Google. According to Robert Deng, an associate professor of new media at Fudan University, many Chinese view the search giant's decision to challenge the rule of law in China as inappropriate, even irrational behavior. "I am disappointed by Google," said Deng. "I agree the Internet users should have freedom of speech, but Google raised this issue in a way that is unacceptable to the government and to the Chinese people." "I am confused by Google's behavior and purpose. Does it want good for the Chinese people or bad for the Chinese people? For the netizens who have been using it for three or four years, if they [Google] want it good, stay here. If they want it bad, really, you go," said Deng. Comments and surveys posted on Chinese web portals indicate a broader population who do not support Google and also view the company's actions as a move to damage the country's reputation abroad. Eighty percent of those who responded to a survey on the popular portal Sina.com said the Google exit would not damage China's IT industry. "It's only Google's loss," one Web user said. "Sooner or later there will be someone stronger than Google. And Google is dead because it is now involved in politics." Another Chinese Internet user who declined to be identified for this article said: "Many Chinese don't support Google. Most Chinese think business is business, and it should not be related with politics. The government will try to tell people that Google is too political and wants to try to force more human rights or democracy issues on China. In this case, most Chinese won't like Google." Qin Gang, a spokesperson for China's Ministry of Foreign Affairs, said Tuesday Google's moves would not impact Sino-U.S. relations. "The Google incident is just an individual action taken by one company -- I can't see its impact on Sino-U.S. relations unless someone wants to politicize it," he said.